Mk 1:12-13 Soon afterwards, Jesus is led by the Holy Spirit into the Judaean Desert where his resolve to follow God’s will is severely tested by the ‘satan’ (a Hebrew word meaning the ‘accuser’). The ‘satan’ (or the ‘devil’) is the one who accuses people at the final judgement, and who tempts people to follow man’s ways instead of God’s ways (see Job 1:1-12, Zechariah 3:1-2, 1 Chronicles 21:1 and 2 on Map 5). After forty days and nights fasting without food (like Moses on Mount Sinai – see Exodus 24:18), the devil tempted Jesus to turn the stones into bread (see Matthew 4:2-4). The Judaean Desert is a barren, rocky desert (see Map 5). Some stones are coated in soft lime and curiously resemble loaves of bread – making the temptation doubly painful. Although Jesus had the power to turn stones into bread, he resisted the satan’s suggestion by quoting from the Jewish scriptures: “A person does not live by eating only bread, but by everything God says” (Matthew 4:4) (see Deuteronomy 8:3). The devil then transported Jesus to Jerusalem and tempted Jesus to throw himself down from the Pinnacle – the highest point of the Temple. He also quoted from the scriptures: “If you are the Son of God”, he said, the angels “will catch you in their hands so that you will not hit your foot on a rock” (Matthew 4:6) (see Psalm 91:11-12). Jesus again resisted the temptation to glorify himself and responded again from scripture, “It also says in the Scriptures, ‘Do not test the Lord your God’” (Matthew 4:7) (see Deuteronomy 6:16). 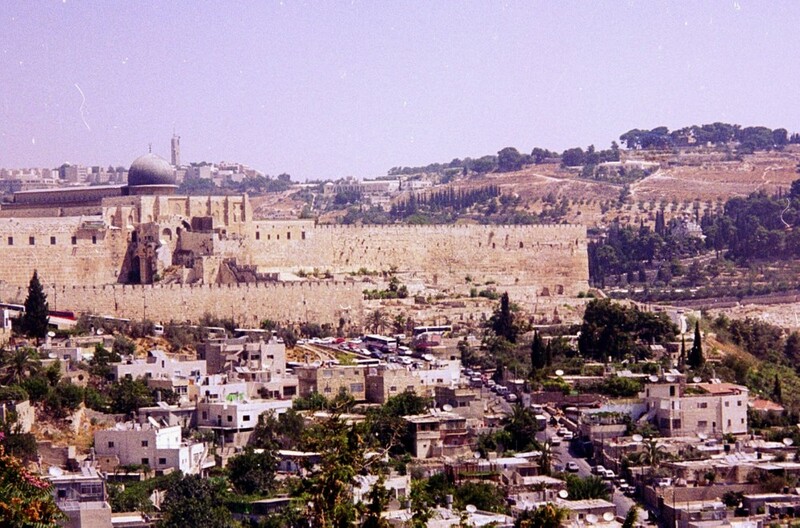 Following the destruction of the Temple in 70AD, the Pinnacle of the Temple (its highest point) was incorrectly identified by medieval Christian pilgrims as the south east corner of the Temple Mount (the highest point of the ruins of Jerusalem at that time). The devil then took Jesus to a very high mountain and showed him all the kingdoms of the world. The Judaean Hills reach up to 2447ft / 746m and offer extensive views westwards towards the Mediterranean coast and eastwards across the Dead Sea. The satan tempted Jesus by offering him all the wealth of these kingdoms if Jesus would bow down and worship him. Jesus resisted the lure of wealth by following the word of God. “Go away from me, Satan! It is written in the Scriptures, ‘You must worship the Lord your God and serve only him’” (Matthew 4:10) (see Deuteronomy 6:13). The place where Jesus was tempted by the devil is traditionally regarded as Jebel Qurantal (the ‘mountain of temptation’), overlooking the Jordan Valley near the site of Ancient Jericho. Today, the Greek Othodox Monastery of the Temptation, built originally in the 6th century, provides a magnificent viewpoint across the Jordan Valley for visitors who walk from the foot of the cliff or take the cable car up to the restaurant.